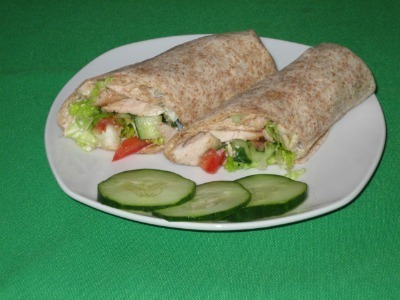 Chicken Salad Wrap Recipe is a great way to get the kids eating healthier. You can find chicken salad wraps listed on just about every menu these days. Why you might ask? Well, they are fun to eat, delicious, healthy and a nice change from fast food or certain sandwich selections which have become boring or all too familiar. Kids love them and they make a great meal at school or home. Fast and simple this recipe provides a healthy meal that kids and even adults enjoy. If wraps become a big hit with your family, dedicate one night a week and make it wrap night for dinner fun. Of course you can change this recipe to suit your taste buds and by using the leftovers you may have left in your fridge. Nothing is set in stone. Try an assortment of different meats, veggies and dressings for a variety of mouth watering creations. Chop the cucumber and tomato until you get 1/8 cup of each. Shred the lettuce leaves. The cooked chicken can be chopped, sliced or shredded; which ever style is more appealing to the kids. In a bowl mix the cucumber, tomatoes and lettuce and add salt and pepper to taste. Once heated remove from pan and thinly spread the wrap with ranch dressing. Now place the mixture in the middle of the wrap. Fold in all sides of the wrap and roll up tightly, this keeps the filling nicely tucked inside. Cut in half before serving and garnish with some veggies if desired. 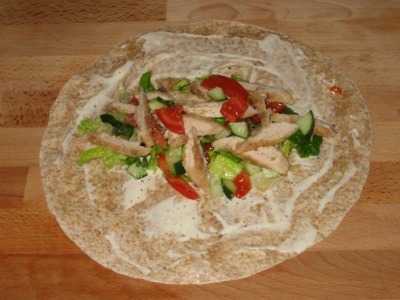 This recipe makes one wrap and serves 1-2 depending on age and appetite. These wraps also go great with a cup of homemade soup on the side. Many think of this chicken salad wrap recipe as a quick and nutritious kids meal but it really makes a good meal for the whole family.